Stores reference 1A/3927. By Waring & Gillow Ltd. 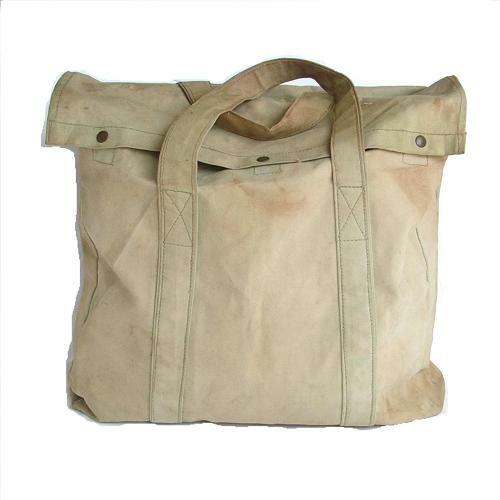 The ultra-rare light green canvas holdall used by the Navigator to carry their chartboard, maps, parallel rules, pencils, protractors, compasses etc. Approximately 50 x 50cm with flapped pockets on both sides and two carrying handles. Stamped with manufacturer's marks, war department broad arrow and 1943 date. The heavy cotton canvas is very faded and has marks and stains. It is generally in good/sound condition but one of the side pockets has a couple of small holes and there is further damage to the 'flap' and handle on the same side - see photographs. Clearly well used but still a great display piece. These bags are always highly sought after and rarely turn up. We sold this one to a client a few years ago and recently bought it back. Don't miss it! Stock code M22305.